Sophomore forward Natalie Sicher has provided a spark off the bench all season long, tallying a total of 14 points across her 16 appearances. 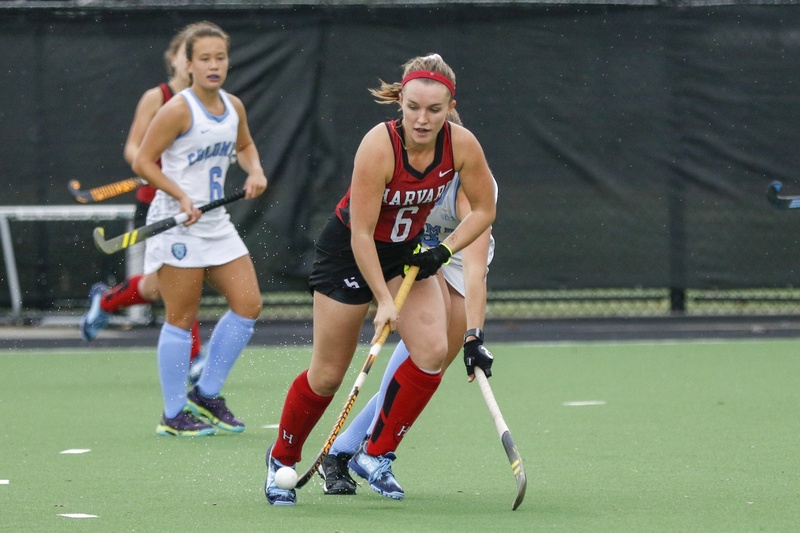 Sicher had both a goal and an assist in the final regular season contest against Columbia. In late August, the Harvard field hockey team was gearing up to open its season against the University of New Hampshire. At that time, the squad had no way of knowing that it was about to embark on what would be one of the most successful campaigns in program history. Starting with New Hampshire, the Crimson trounced its first three opponents before heading into its matchup against then No. 3 Maryland at the Terrapin Invitational on September 9th. This test was a bit too much for the group to handle at the time, as the Terrapins came out on top, 3-1. However, after leaving College Park, Md. with the bitter taste of defeat in its mouth, Harvard would do something that it had never done before. The group rattled off 13 straight victories, shattering its previous program record of eight consecutive wins. Consistent hard work paired with the proper mindset is something that should never be overlooked. That being said, the statistics reveal that this year’s squad has in fact been fundamentally different than previous iterations. There is an old mantra in sports that extols, “offense wins games, but defense wins championships,” and it was the Crimson’s stifling defense that catapulted it up to the top of the Ivy League. It is allowing a mere 0.65 goals per game, down substantially from last year’s mark of 1.22. This has more than made up for the slight dip in the team’s scoring average (3.7 goals/game this year compared to 3.8 the previous season). Depth is extremely important, especially throughout the course of such a long season. The roster brims with players who can contribute. The youngest and the oldest — the freshmen and seniors — have certainly both left their mark, but in different ways. A new injection of talent is always refreshing for a team, and the group of first-years provides just that. Goalkeeper Ellie Shahbo has started in 11 games and has made an appearance in two others, while midfielder/forward Rachel Greenwood and midfielder Kiley Allen have started in 17 and 16 of Harvard’s contests, respectively. The seniors, on the other hand, play a role that comes naturally with their experience. They lead by example and stabilize the team, making sure that everyone is focused and ready to go. All of these factors have been crucial to the Crimson’s historic win streak. Nevertheless, a team’s record is an incomplete view of how its season has gone. The squad had been able to carve out these victories, but not always by playing at its highest level. Competing with the best in the country is exactly what was required in Harvard’s game against conference rival Princeton on October 20th. The Tigers were ranked as the No. 3 team in the nation heading into the contest, and this late-season matchup was in essence a de-facto Ivy League Championship game. That Saturday, the Crimson proved to itself and to the rest of the country that it is a legitimate threat. Despite being outshot, goals from three different Harvard players propelled the team to a 3-1 victory over Princeton. The result was a culmination of a season’s worth of focus and improvement. This mindset has paid off, as the Crimson achieved that goal. After entering the game ranked No. 6, a 6-0 thrashing of Dartmouth guaranteed the team at least a share of the Ancient Eight title, the fifth in team history. A second consecutive 6-0 win the following week against Columbia allowed them to clinch it outright. Nonetheless, the journey Harvard embarked on in August is one that has not reached its conclusion quite yet. Van Herwaarden’s squad will have to maintain its focus, mindset, and hard work if it hopes to make a splash in the NCAA Tournament. It will take a team effort, but confidence is high and the whole roster is willing and ready to build off of what has already been a successful season. The Crimson now prepares to face off against Penn State this Friday, November 9th, in a regional semifinal in Princeton, N.J.